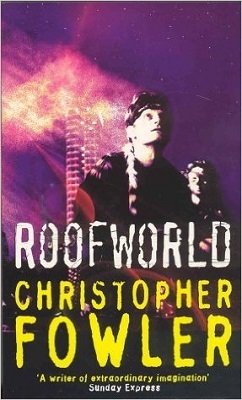 I had never read any of Christopher Fowler’s work until I read Roofworld, but I’d heard good things about the book. I didn’t have to get many pages into it before I discovered that I’d heard right. It’s excellent. Roofworld is the story of a society living secretly in London and very differently from the rest of the City dwellers (who the Roofworlders call the ‘Insects’). The Roofworld community has been around for a long time, but there have been some new developments up among the roofs and the man behind the changes is called Chymes. The present-day Roofworld is lead by Nathaniel Zalian and he’s a good guy. The hooded man, Chymes, on the other hand, is not a good guy at all and a lot of the Roofworlders have either been killed by him or gone over to join him and his occult society. Although the Roofworlders are living separately from the rest of society, whenever the victims of Chymes’ dark and unusual sacrifices turn up on terra-firma it draws attention to the fact that something strange is going on above the heads of the city dwellers. When the body of a teenaged boy falls from the flaming remains of a neon Coca-Cola sign Detective Chief Inspector Ian Hargreave is put in charge of the investigation. Hargreave is not the only ‘Insect’ that gets dragged into the Roofworlder’s war. Two of the books main characters Robert Linden and Rose Leonard also hail from the ranks of those who would normally live underneath a roof rather than on top on one. Robert is trying to find out who owns the rights to a book called The Newgate Legacy because the company he works for is considering making it into a film. While searching the flat of the recently murdered author he finds something that seems to be a manuscript for another book and it eventually leads him to Roofworld. Rose is employed to take care of the apartment block where the author lived and she too ends up ‘going up’ and meeting the Roofworlders. Roofworld is a very imaginative work and when Fowler describes the Roofworlders sliding along nylon cables, called runs, and travelling from one building to another above the busy night-time streets, he manages to make it all sound very plausible, if a little scary. There is no shortage of imagination either when it comes to the way that some of the characters die and they die in all kinds of unusual and bloody ways. Roofworld is 400 pages long and I enjoyed reading every one of them. It’s one of those books that makes you feel almost a little sad when you reach the last page because the adventure is over and you have to say a final goodbye to the characters. Until the next time that you read the book, that is.